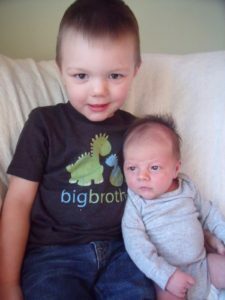 Levi’s birth story starts with the birth of our first son, Henry, who is now 2 ½. 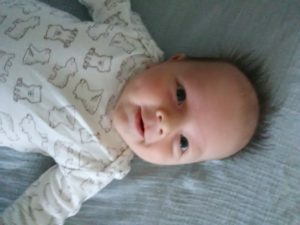 With Henry, we were committed to a natural birth but didn’t feel completely on board with having a homebirth, so we decided to have him in the hospital with a midwifery group. The decision was made partially out of fear of the what-ifs and partially because we were living in a two-family house where I didn’t feel I would be comfortable laboring. At the time, I also didn’t see how a physical location could impact the birth so much and didn’t understand how important it was to have good support during labor. I figured we would be fine and that our arrangements were good enough. 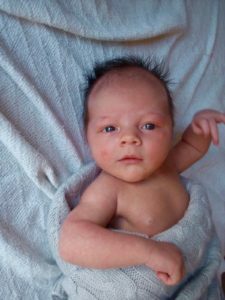 We did a lot to prepare for Henry’s birth, most significantly taking a Bradley Birth class where we learned a ton, which is probably the only way we were able to be successful in having a natural birth. However, our success in that area did not mean everything was ok. Henry’s labor was slow, long, and rough. 1 cm on Monday, 3-4 cm Tuesday night, with his birth occurring Wednesday at 12 noon. During this time, I suffered through intense back labor for hours, only to find out that at 9cm I had a lip on my cervix, which led to the decision to break my water. Once the water was broken, I went through the most terrifying 30 minutes as the contractions intensified beyond anything I can describe, and my husband and I were completely alone in the hospital room. I thought in this moment that something was surely wrong and they were most likely off prepping for my C-section. I was completely terrified, and I was sure that something was wrong with either the baby or myself. There was no way this was normal, the pain was too much, and something had to be wrong. After the lip on my cervix failed to resolve on its own, it was manually stretched aside as I began to push the baby past it. I pushed for two hours, during which time there was hushed talk of getting a doctor. Overhearing this, and not knowing why we would need a doctor, I pushed them to tell me what was going on, at which point they told me pushing wasn’t going great (it had been about an hour at this point), and they might need to use a vacuum assist. In my mind, I was like, “Oh hell no! I have done too much work for it to end like this!” Luckily, no vacuum was needed! Once I knew what was going on, I changed the way I was pushing and was able to get him moving along! Had they only told me I wasn’t pushing effectively from the start, this could have all been avoided. It was another moment where I felt helpless during the labor and completely uninformed about what was going on with my own body. So, finally, with a healthy 9lb 4 oz boy in my arms, it was all over, but I was left with a heap of emotions and feelings to process. Upon arriving home with our baby, I struggled for weeks, if not months, and would cry almost daily when I thought back to those moments in the hospital in which I felt most scared. I would look at our son with love and also with major flashbacks. Following his birth the midwife left promptly, and I never saw her again nor got to ask any questions to clarify the events of the labor in my mind. When I went to my six-week, visit I met with someone I had never seen before and tried my best to explain how I felt unsupported and very shaken up by the experience. I was told that she had no clue why it was that way for me and maybe I should write a letter saying how I felt about it. (Which I never did because I felt they wouldn’t even know who I was and it would just fall on deaf ears). I talked through my story many times with many people, but my husband was the only one who witnessed the hard moments to fully understand what I was talking about, and even people I was very close with who listened carefully just couldn’t understand it. Following a miscarriage with our second pregnancy, we conceived again and were happy when we had made it to 10 weeks! At this point, I was already looking around online and had talked to a lady I knew through the Bradley Birth Class about her experience using HeartSpace. She had nothing but amazing things to say, and she addressed some of my concerns about feeling afraid being home. We did a consult visit with Heidi and Maureen, which lasted at least an hour, and my husband and I got so many questions answered about all the what-if scenarios in my mind. Immediately I felt a difference in this appointment, as I didn’t feel rushed to get through my list of questions, and I didn’t feel like I was inconveniencing anyone by having questions and concerns. They even took the time to discuss my son’s labor with me and gave me more clarity about his labor than I had gotten in two years as they explained that most of my difficulties were problems with the baby’s position. I felt like this was it, I was ready to go forward and have a baby at home! We began with our monthly appointments, and it was a total adjustment for me! We sat on a couch, my son played nearby, and we talked about anything I needed or wanted to. It was awesome! Along the way, I made a hard discovery that the trauma from my first labor was not resolved, and I was becoming panicked about the thought of going through it all again. Heidi was so supportive as I sobbed my eyes out on the couch, and she referred me to someone who could help me through it. This was HUGE for me, because someone finally recognized that it was a real struggle. Two and a half years later, I was able to find resolve for all these feelings, and I began to get excited to have our next baby and see how different it was going to be! So the time came near, the house was all set up with the birth pool and a twin bed in the downstairs of our house. And so we waited. Levi was due Jan 9th, and on the 18th, I woke up at 3am with a decent contraction, some fluid, and bloody show. I had been having weak contractions randomly for about two weeks, so I was excited because I knew this was the real deal! I stayed in bed until 7:00, my husband called in to work, and we spent the day resting and waiting for things to pick up speed. It was going slowly, but it gave me time to get emotionally ready for the birth. Henry left with my mom around 3:00 in the afternoon, which turned out to be very emotional for me. He was my only baby until now, and I knew things would be different when he came back home to a brother. I spent the evening crying on and off about this and feeling discouraged that the labor was still going slowly. I had been texting Heidi throughout the day, and around 6:30-7:00, she told us to get in bed and rest laying on my left side. So we did, and whether it was the positioning or the fact that I really tried to let things go and relax, or both, things picked up at this point. I was only able to lie there maybe an hour, and then I needed to get up! I let a few more contractions pass and tried to see if they were really as bad as I thought they were, but realized I couldn’t talk easily to my husband through them anymore. We decided to call Heidi, who calmed my uneasiness about calling her too early by saying it was no big deal, and, if it was too early, they would just sleep somewhere! Maureen arrived first around 9:00 and was shortly followed by Heidi and Mary. Maureen asked if I wanted to be checked for dilation to see if it was appropriate to get in the water yet. I was a mess, and I began to get emotional again. The fact that everyone was at our house meant that this was actually happening! I couldn’t decide whether to get checked, knowing I would be upset and discouraged if I wasn’t far along. So Maureen decided for us that she wasn’t going to check, as I was getting way too hung up on making the decision! So I got in the water with the understanding that if things slowed down, I would have to get out . . . . but they didn’t! Even so, I was feeling so impatient with the labor. In between contractions, I was talking to my husband, saying how it just didn’t feel painful enough yet and how I was so bored! Shortly after Mary came over and sat with us by the pool. It was nice to have her there, and I felt I could ask about anything that was on my mind, like, “Do people get far along in labor without feeling a lot of pain?”, “Do you ever get sick of watching babies be born?”, “Is it normal to feel completely fine in between contractions?” (With Henry, I felt so out of it, even in between, and this time I felt like I wasn’t even in labor). Having Mary near and having a conversation flowing really helped me relax, as I am a talkative person! I would have a contraction and in between we cracked jokes and talked about random things. We had a good thrill as Mary suggested that I could reach in and feel the baby’s head since I was dilated. It never even occurred to me to do such a thing, and I figured why not try it?! How often can you do this?!! So that was fun! After a few hours, I got out to switch things up and made a comment that I felt a ton of pressure, to which no one seemed surprised. We decided to check dilation. Maureen was checking as I sat there asking if it was bad and if I still had a ways to go, to which she responded happily that I was 9cm! I was in totally shock and disbelief and was soooo happy to hear this! I continue to this day to say how I can’t believe that I was 9cm at that point; it was a high point in the labor after feeling so discouraged earlier! I got back in the water for a short time, still waiting for my water to break. However, something just switched in me, and I stood up and decided I needed to get out. It just didn’t feel right anymore and didn’t feel like it was working. At this point, I headed to the bed, where I had very intense contractions for about another hour or hour and a half. These were horrendous as I began to get back labor and my hips were locking up. As the pain increased, I was fighting the contractions some and couldn’t decide how to position myself or what to do. Someone would ask if I wanted this position or that one, and my response was, “I DON’T KNOW!!!! IT’S ALL TERRIBLE.” And, at those times ,Maureen (at least I think it was her, it starts getting blurry) would just choose one. At one point, when told to try hand and knees, I told everyone I was willing to go on my hands and knees but they would have to put me there as my back and legs were all locking up and I couldn’t get my legs to move! So they just moved me! As the labor continued, the back pain and intensity triggered a lot of feelings from my first labor, and I began to get a little panicked and fearful and began to yell stuff along the lines of, “This is always so terrible” and “Why does this part always go so badly?” The beauty in this dark moment is that I was surrounded by people who knew this was an issue for me, and who knew that I had some leftover fear from my previous labor. Maureen stepped right in and just shut down the negative spiral I was going down in my mind. She reminded me that it had only been bad once before, and this time I was not alone and was surrounded by help and that meant it was going to be different. And it was! I began to regain focus and found that looking in the mirror and watching things start to open up was a good distraction from the pain. I also got to feel the bag of water before it eventually gave way with a super loud pop that shot fluid right into the hand mirror with a ton of force! Honestly, it was awesome! I had no idea it could do that, and it’s a moment I will not forget! With the water broken, I began pushing with the next contractions. SO MUCH PRESSURE and way more pain than I remembered with my first. “How giant is this kid going to be?” I was thinking as I pushed! Well surprise, he had his arm crossed over and his hand alongside his head! Once he crowned, it just hurt like hell, and I ended up having to wait for the next contraction to finish getting his head, and hand, out of there. During this time waiting, I found it really helpful to feel the baby’s head to keep me focused and grounded. I never did anything like that with my first, but this time it was just an instinct to touch, and it helped me make sense of the pain somehow. The next contraction came, and the hand and arm were all maneuvered where they needed to go, and I opened my eyes from pushing to see my little Levi being brought right up to me! YAY, he was out! So now we waited for the placenta for a few minutes while we admired our little man and how much he looked just like his brother. I asked if we could leave the cord attached for a minute so I could see how it looked all together the way he was inside, and that was no problem! It was really neat to see everything all attached and feel the cord and see the placenta. In the hospital, it was all a blur, and this was so relaxed! I liked feeling like I could take my time to see what I wanted to see and soak it in and process it all for a few minutes! Birthing your child is such a special thing that only happens once, so why rush through it all! Once baby was cut loose and we were settled in, we had time to just lay and admire our baby while everyone started cleaning and packing up the pool and getting us food. It was great! Mary even did a load of laundry! A few hours later, everyone was gone and we got to sleep undisturbed. We continued to receive awesome care at all the follow up visits. I realized how important it was for me to be able to talk about the labor with people who were there and who could help me clarify the events. I felt so much more stable and happy after Levi’s birth. Nothing about having him or looking at him triggered anything terrifying, and I wasn’t constantly crying! I look back at this whole experience with nothing but gratitude to the HeartSpace team and amazement at how different this experience was! I didn’t have to feel like I was an inconvenience to anyone as I labored through the night. I felt heard, cared for, supported, understood, loved, safe, and respected like a person, rather than a specimen lying helplessly confused and exposed on a hospital bed! While it’s easy to wish I had never been through the struggles of having my first son, I can now appreciate and love what we have found with HeartSpace even more! 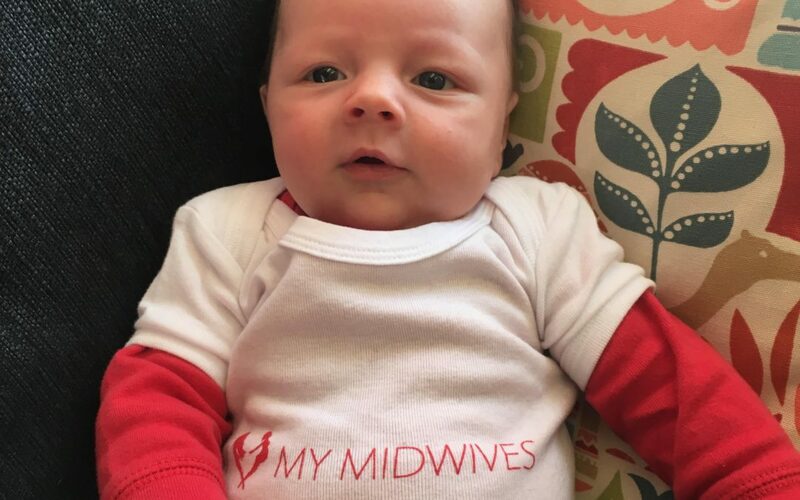 We wouldn’t choose to birth any other way now and look forward welcoming more babies into our family with our wonderful midwives!